Susan Dupor lives in Lake Geneva, Wisconsin where she paints in her studio and teaches art at the Wisconsin School for the Deaf. She was born deaf and has an older hard of hearing brother. She grew up in Madison, Wisconsin. In Madison, she attended "hearing-impaired" mainstream programs from kindergarten through twelfth grades. She enrolled in the Rochester Institute of Technology majoring in Illustration. She later transferred to the School of the Art Institute of Chicago, where she earned her BFA. She then worked for a year in an animation studio before going on to earn a Masters of Science in Deaf Education and Art Education through a joint program at the University of Rochester and Rochester Institute of Technology. Her work has been included many group exhibitions such as the national touring exhibition, "Elements of a Culture: Visions by Deaf Artists"; "20 Deaf Artists: Common Motifs" at Pro Arts Gallery in Oakland, CA; "Work by Deaf Women" at Ceres Gallery in New York; and "A Deaf Perspective of Deaf Culture Through Art" in Haverhill, Massachusetts. She also had a solo exhibit at the Washburn Art Gallery at Gallaudet University. Her work made appearances at the Switzer Gallery in Rochester, New York in 1993, 1995, 1996,and 2000 and at the Deaf Artists of America Gallery, in Rochester, New York. 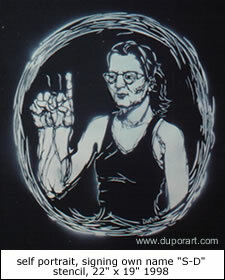 © 1999-2007 Dupor Art. All rights reserved.